The heavens opened, and Public Transport Victoria put up a display of its legendary unreliability in extreme weather conditions. he trains were delayed and even when a drenched Samia Sofai managed to get to Thomastown Station, the bus she caught broke down on its journey to the Thomastown Library, where she was going to do her volunteer work for Y Challenge. It was a testament to her reliance and good humour that she arrived with a smile on her face when I met her to discuss her work. 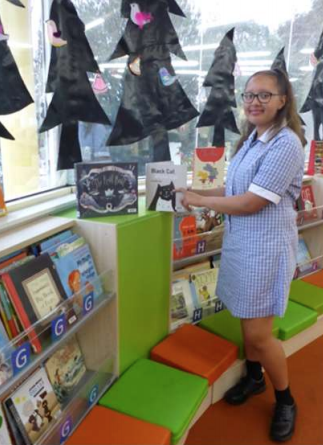 A regular user of the library, Samia opted to do her volunteer at the lively community hub that is the Thomastown community Library. This was an excellent choice in terms of working within an organisation that could give her a variety of challenging work experiences. Thomastown Library, under the management of an energetic 26-year-old, Ian Wedlock, operates as a community hub as much as a library. One of Samia’s tasks is to set up for the wide range of activities the library offers local citizens. The myriad activities include knitting and textile activities like making boomerang bags, UV printing, gardening, carpentry, screen printing and there is even a program where highly friendly and obedient dogs, and their owners support a reading program for youngsters in the area. When Samia arrives on Friday afternoon, its usually the tail end of the library’s activity programs so this precludes a lot of interaction with library users, but instead, she has become a great support to the library staff. “She is very responsive to advice” says Ian. Samia feels her confidence has flourished through this support work. “Even though I often used the library, I was hesitant to ask the staff for any help. Nowadays, I feel quite happy to approach people and get their help or to ask them if they need a hand”. This proves the volunteering maxim, that people often find, that with volunteer work, you often get back, far more than you give. 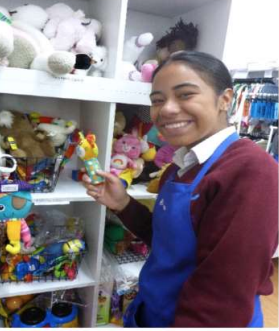 Olivia Siaosi began her work at the Salvos in Epping with an extensive induction. “There was huge book on the policies and procedures”. It was just as well that Olivia read everything as she has had to work in a wide range of roles in the organisation. “I’ve done everything from working in the warehouse, where they receive, sort and price donations, to the shop floor where the main tasks are sorting, cleaning and assisting customers. “I even had some time on the phones, answering queries”. As I arrive to interview Olivia’s supervisor, the staff are setting up the furniture and manchester area with a pre-Christmas sale display. “All sorts of people come in. There are the people looking for unusual things and bargains, but there are also people who are really doing it hard. It’s nice to be able to help people”. 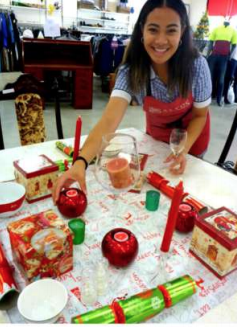 Working at the Salvos has given Olivia a higher profile in the community. “I live locally but now people recognise me in the street and stop to Say hello”. Olivia recognises that she is gaining as much as she is giving in this Y Challenge volunteering activity. From Epping it’s a quick run south to see Megan Culhane at Preston West Primary School. I wanted to meet Mr Andronicus, Megan’s supervisor. He had just sent me an almost impossibly glowing report on Megan and her work with his colleagues. Megan is particularly well placed to work with Mr Andronicus in the Arts area. She has always had passion for dance and particularly ballet. Her enrolment at the Brunswick School of Dance has influenced her desire to possibly become a dance teacher in the future. Even now, she sometimes takes responsibility for teaching some of the younger dancers. 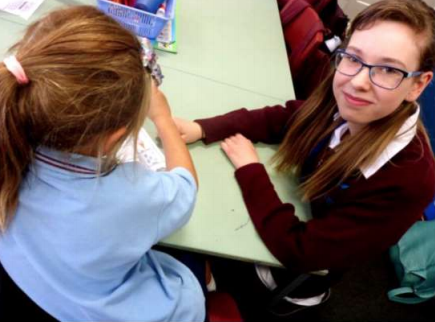 Megan very much enjoys working with the prep students, regardless as to whether she is placed in the Art room or in mainstream classes, supporting students with their academic subjects. “The children are really curious and sometimes they ask me about high school. Whether I’m helping with worksheets or just playing with them during free time, it all feels good. Basically, I just really enjoy helping and supporting people”. The preps are chatters and there is a torrent of conversation with Megan about their trips, interesting things they’ve done, or in fact anything. oday a couple of bright littlies are launching forth about the Bird of Paradise flower they have brought in for show and tell. Megan has clearly established a warm and supportive relationship with them and Ben Corrs, their class teacher. With Vinnies in Edwardes St Reservoir opening recently and being short of volunteers, the arrival of three William Ruthven SC students looking for a I arrive at the shop on a busy Friday afternoon to find Ragaa Timbira collecting a selection of glamorous dresses and teaming them with accessories in preparation for the pre Cup Day sale. Vinnie’s manager has picked the right person for this job as Ragaa has always been interested in fashion. 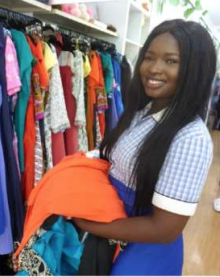 Before being taken on as a volunteer, Raja had never stepped inside an opportunity shop, but she has realised that in these sorts of shops, a wide range of really great clothes can be found. Volunteering is not new to Ragaa who regularly volunteers at her church, where she has been involved in a wide range of fundraising activities. For Ragaa the best part of her work as a volunteer is the opportunity to interact with a wide cross-section of people. 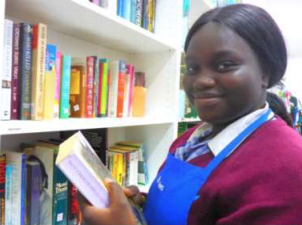 Sarah Harik has spent several visits at Vinnies, sorting out the book section. It’s a never-ending job making sure everything is organised in categories. “Customers are always looking through the shelves and they don’t often replace the books where they belong. It’s also an opportunity to look through books that we don’t have in the school library. I thought I might like to read The Hunger Games Mockingjay”. Like Ragaa, Sarah is also involved in volunteering. The Nubian community is involved in a variety of community projects and they are always grateful for a helping hand from enthusiastic young people like her. Revival Siaosi at first found it a little stressful when customers asked her for information. “We wear the same blue aprons as the regular staff and they assumed we knew where everything was. It took a while to understand the layout of the store”. For Revival, its important for volunteers to really think about their interests and skills before they offer to become volunteers. “In the community there are loads of opportunities to do volunteering. You have to think about what sort of environment you feel most comfortable in. When you are happy, you will probably be more use to other people” she explains. Wearing the school uniform at their volunteering placements, the William Ruthven students are also ambassadors for the college and showing the people of Reservoir that as well as teaching our students the skills and content they will need in order to navigate their futures, the college places an emphasis on developing in our students the values that will guide them to become productive and active citizens within their community.